KINGDOM HEARTS III is a game that people have been anticipating since KINGDOM HEARTS II was released in 2006 here in North America on the PlayStation 2. Since that time, there have been six additional un-numbered (and TWO orchestra concerts that are ALSO franchise-canon, one of which oprainfall attended) games released in the KINGDOM HEARTS series across multiple platforms to various degrees of acclaim and success (I’m looking at you, KINGDOM HEARTS Re:coded). It is with all of this history behind it that I was excited to finally get my hands on KINGDOM HEARTS III at E3 2018 after having attended the first-ever KINGDOM HEARTS Union χ[Cross] Dandelion Meeting earlier this year, and I found both a lot to love and somethings to be concerned about. 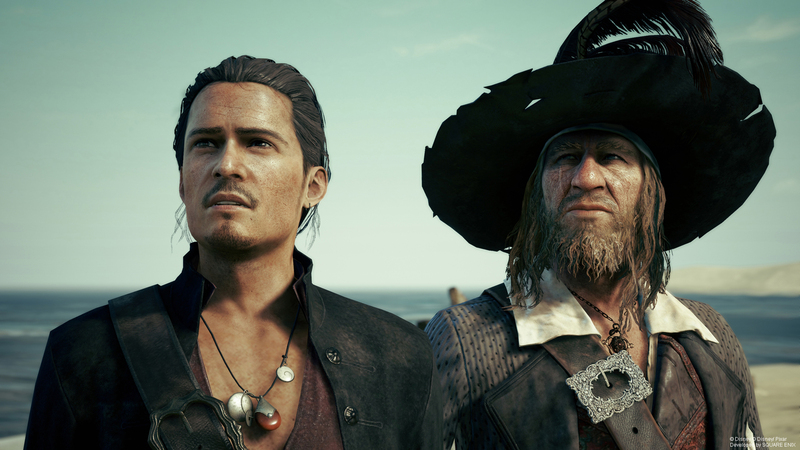 This hands-on impression will not address the story cutscenes, so be assured that it is STORY SPOILER FREE. 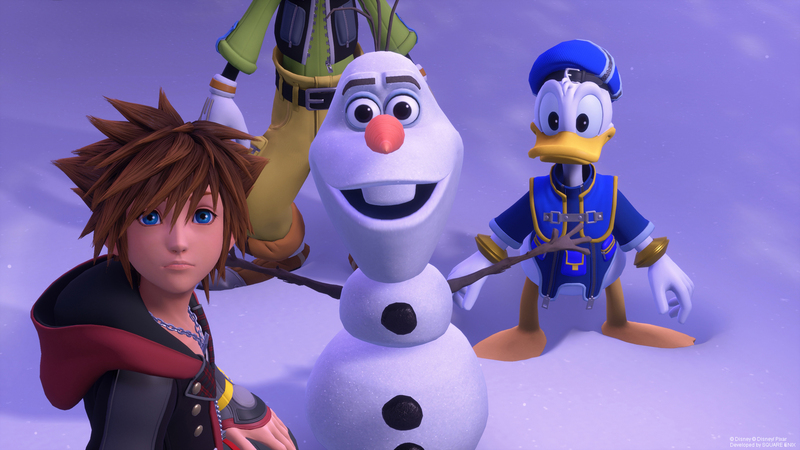 At E3 2018, there were two demos available to play for KINGDOM HEARTS III: First, Olympus, which comes from the Disney Renaissance-era classic Hercules and second, Toy Box, which is an interpretation of Pixar’s 1995 big-screen debut, Toy Story. I was able to barely get through both of these in turn during my allotted time. As I was dropped into Olympus, I saw that I was armed with the classic Kingdom Key and the standard KINGDOM HEARTS tier-two spells of Fira, Blizzara, Aerora, and Cura. While I killed Heartless in what was clearly a training-demo level (and as I later saw again during the Toy Box demo), I noticed that this is a simply gorgeous game – and probably the best looking KINGDOM HEARTS game ever. The worlds are amazingly lit, the character models feel more lifelike than ever, and it really did feel like I was dropped into the Hercules and Toy Story universes. This game switched over to Epic Games’ Unreal Engine 4 in 2014, and it shows in the game’s quality. If I was not on a demo timer, I would have spent as much time as possible just exploring the environments. 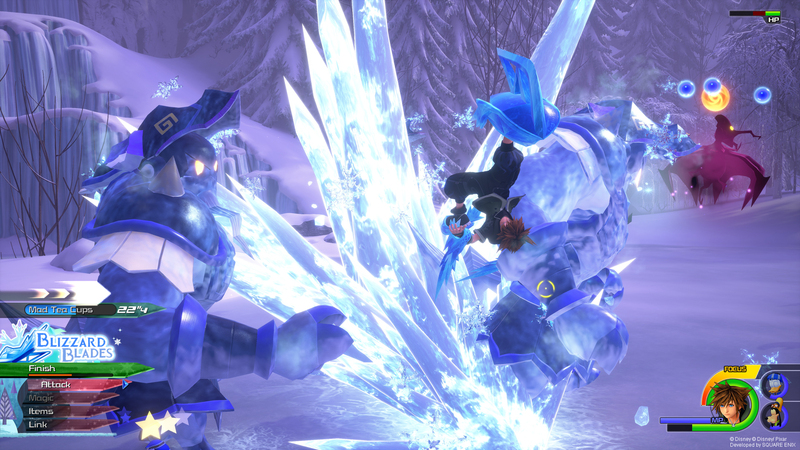 With the 2014 switch to Epic Games’ Unreal Engine 4, KINGDOM HEARTS III looks spectacular. (Images owned by SQUARE ENIX). That said, the basic combat control scheme had not evolved that much from classic KINGDOM HEARTS fare, but has instead only gotten more complicated with additional mechanics being added in. The most noticeable change is that Flowmotion is making a return from KINGDOM HEARTS: Dream Drop Distance and KINGDOM HEARTS 0.2: Birth by Sleep –A Fragmentary Passage-, but in a heavily modified and restricted form. In KINGDOM HEARTS III, Sora can now run up walls that are illuminated by a set of translucent white waves ripping over it. When Sora goes onto one of these walls, the perspective switches immediately behind Sora and he goes along the wall and dodges falling boulders to get to the boss fight (as he did in the Olympus demo) or towards Andy’s window on his bedroom walls (as in Toy Box Demo). That being said, this comes with a surprising caveat: Sora can only run on a wall in the four cardinal directions, for there is no free-form running. This lack of free-form running I honestly feel is a mistake, because it turns what is a way to continue the gameplay immersion into something that feels limited and gimmicky for no reason. I am disappointed that Flowmotion is not coming back in full, as the Flowmotion mechanics from KINGDOM HEARTS: Dream Drop Distance and KINGDOM HEARTS 0.2: Birth by Sleep –A Fragmentary Passage- really added an element of fighting smoothness and environment interactivity to battle. Thankfully, the lack of full Flowmotion is made up for by how you can actively transform keyblades during combat in KINGDOM HEARTS III. If you chain enough hits together in a combo, you get a triangle prompt to transform your weapon to conform with the world you’re in. For example, in Toy Box, I switched over to a hammer that was clearly designed like a toy. My attacks would change to be close-up, and eventually I would get more options to change it once more. In a lot of ways, it is just like a less-restricted version of the Command Styles that Terra, Ventus, and Aqua had in KINGDOM HEARTS: Birth By Sleep. Furthermore, some of these comboed attacks are combined with Donald and Goofy (yeah, they’re back too) to do special attacks as well. 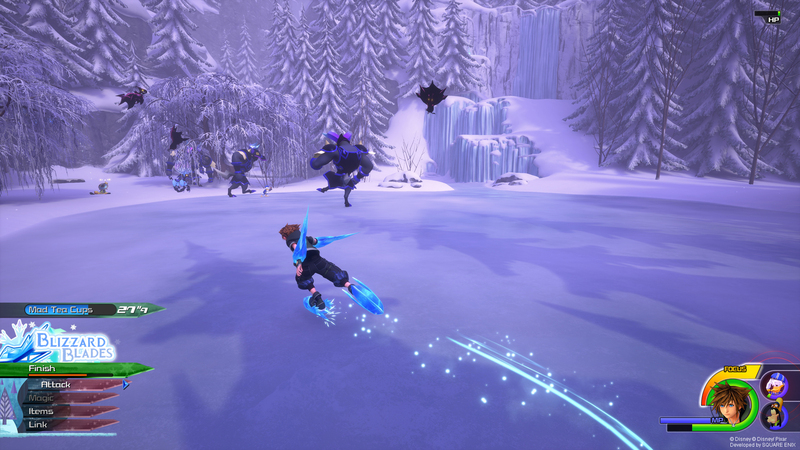 A new battle mechanic, clearly inspired by the Command Styles in KINGDOM HEARTS: Birth By Sleep make a return in KINGDOM HEARTS III. (Images owned by SQUARE ENIX). Of course, what would KINGDOM HEARTS be without summons? In KINGDOM HEARTS III, there are two different types: your classic summons, now rebranded as part of a link system. In the hands-on demo, I was able to experience Wreck-It Ralph and Ariel. 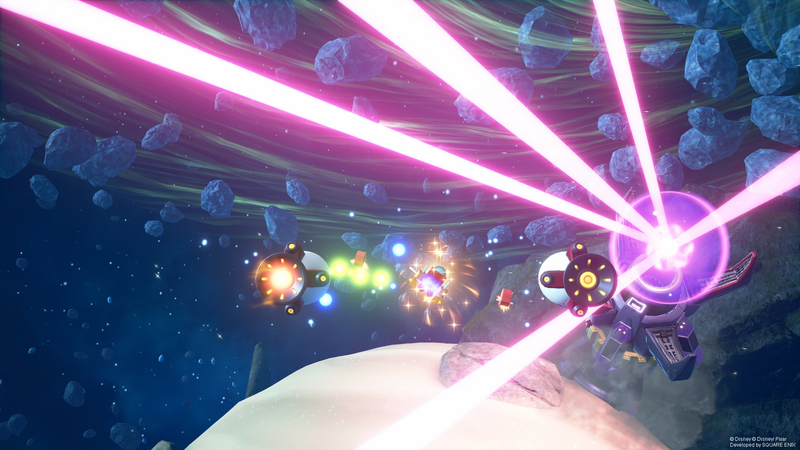 Both of these characters were fully controllable by the player, with Ralph being able to build from a set of blocks, rush enemies, and jump and Ariel having the abilities of Splash and Mermaid Dive to cross the battle map. Each of the link summons have a finishing move that you actively participate in. These two character summons both controlled rather well and yet clearly differently from each other, even if the build mechanic with Ralph did feel a bit hard to figure out. Finally, the second set of summons are what KINGDOM HEARTS III calls “Attractions”. During battle, if you see a marker appear on an enemy and attack it quickly enough, it will then turn into a special situation command. When you activate the command with a press of a button, you will suddenly be able “to call forth a powerful attraction!” (to quote KINGDOM HEART III‘s in-game help tutorial). In what is a clear homage to Disneyland/Magic Kingdom’s Big Thunder Mountain Railroad, you take control of a on-rails train that you can actively aim and shoot at the enemy before doing the big finish attack. These Attractions are world-specific and are very flashy to do, and the train was easily the highlight of the demo for me. 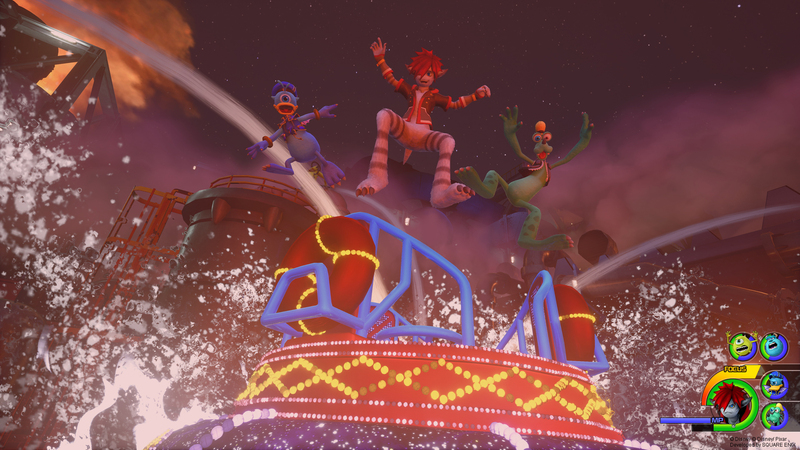 Another Attraction in KINGDOM HEARTS III is one clearly modeled after the Grizzly River Run ride at Disney California Adventure at the Disneyland Resort in Anaheim, California. (Image owned by SQUARE ENIX). If you haven’t figured it out by now, KINGDOM HEARTS III has a very complex fighting system that demands you to be using a lot of different abilities as you play to conquer the Heartless. For people who are newcomers to this franchise or who have only played the mobile game KINGDOM HEARTS Union χ[Cross], this can be something of a challenge to get used to. I did find myself losing focus of what I was doing from time to time, and I wound up resorting to just button-mashing more than once as a result, and I was not happy about that. There are just a few more things to note about KINGDOM HEARTS III from the E3 2018 demo. First, in Toy Box, I was given the opportunity to pilot a Gigas robot inside of a toy store. The robot handled well enough for what it is, and there is apparently content like that exclusive to each world. Second, each kingdom is not, if Olympus and Toy Box are any indication, an open-world experience. While each place was definitely bigger than what I was used to in prior franchise entries, it reminded me instead a lot the places from FINAL FANTASY XV: Platinum Demo in how you can see so much surrounding you beyond your already expansive environment…but it is blocked off from you to explore. Finally, and what I have saved for last is that while fighting the boss for Olympus (one of the movies Titan antagonists), I was told to attack the feet…which I did, and I quickly discovered that there were camera problems present. I often could not see Sora and so I would have issues positioning him to fight and strike the boss’ feet as I was told to. This is an issue that has plagued other KINGDOM HEARTS games in the past, and I am more than a bit disappointed that there are still camera issues in this numbered sequel. To balance that out though, SQUARE ENIX has finally done the impossible and has managed to make locking onto enemies and subsequently attacking them while in the air work to the point where I am not pointlessly slashing in the air repeatedly. 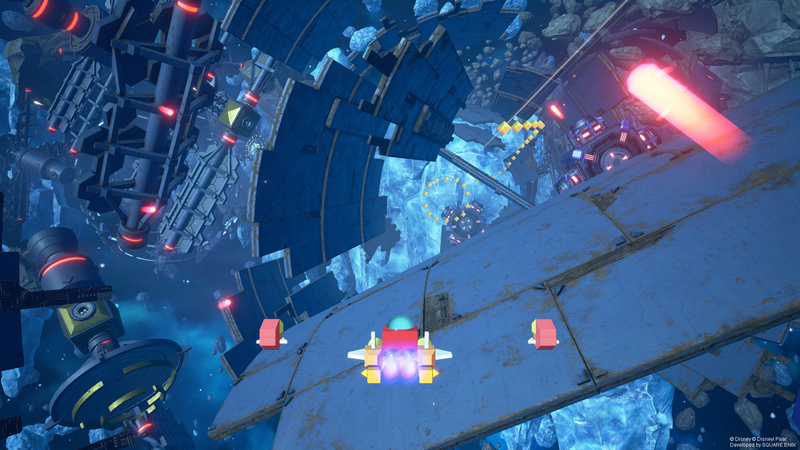 Gummi ships also are making a return in KINGDOM HEARTS III, though that feature was not available to play at E3 2018. (Images owned by SQUARE ENIX). All in all, I am excited for KINGDOM HEARTS III. 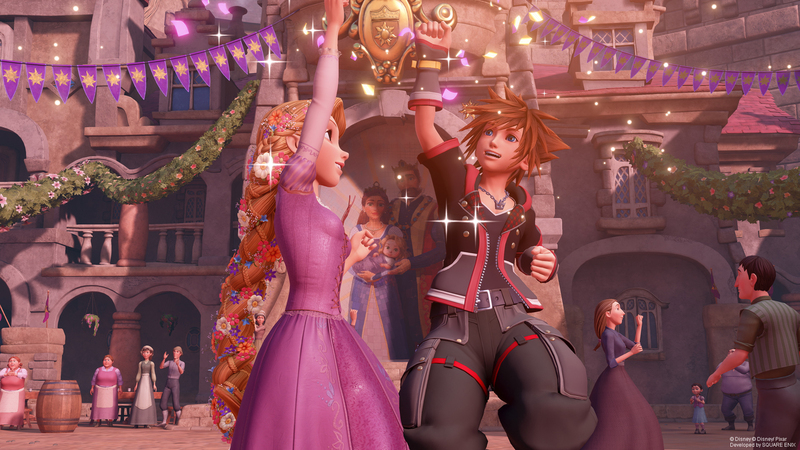 There is simply a lot to love in this franchise (even with the complicated -to put it mildly- storyline…and the barely-fun KINGDOM HEARTS Re:Coded), and I am ready for the final game in this story arc to be released. You can pre-order KINGDOM HEARTS III for the PlayStation 4 (Regular & Deluxe Editions) and Xbox One (Regular & Deluxe Editions) now. You can also order the SQUARE ENIX Store Exclusive Bundle that comes with the KINGDOM HEARTS III Deluxe Edition and three bundle-exclusive BRING ARTS figures of Sora, Donald, and Goofy (PlayStation 4 / Xbox One). What world are you most excited to see in KINGDOM HEARTS III? Are you ready to dive into the game?